Good news writes white they say in the newspaper trade. Similarly writing upbeat songs that don’t either go in one ear and out the other, or become ferociously irritating after a few listens, is harder than it looks. 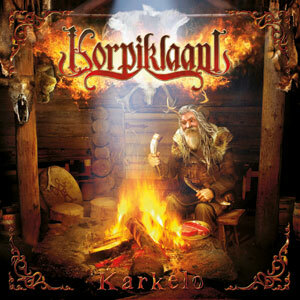 Not for Korpiklaani, though, whose sixth album title translates loosely as “party”. Their best songs all sound like they should be sung on top of a table, preferably while spilling beer and bothering “wenches” with every stroke of the fiddle’s bow. Unusually for a folk-metal band they’re better at folk than metal but tunes like ‘Vodka’ and ‘Isku Pitkästä Ilosta’ are an (im)pure shot of scuzzy endorphins.